If Harlan Ellison, Tom Clancy, James Morrow, and Friedrich Nietzsche co-wrote a novel, they might produce. 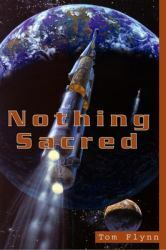 This sequel to Tom Flynn's critically acclaimed first novel, "Galactic Rapture" takes place in a galaxy-wide future civilisation that's obsessed with religion, yet furious at Terra (Earth) for giving rise to the most popular creeds of all.Terra may be the planet where humanity originated, but sophisticated Galactics treat it like a dismal stepchild. Few Terrans seek their fortunes among the stars. Those who try face patronising discrimination. Into this Galactic crucible leaps Earth-boy Gram Enoda, alongside an impossibly intelligent electronic sidekick who's simultaneously his secret weapon and the bane of his existence. Enoda just wants to get rich. Instead he stumbles into the centre of a top-secret, half-baked plan to (yes, literally) save the galaxy. Like "Galactic Rapture", "Nothing Sacred" is brimming with complex plotting, searing black humour, colourful characters, and penetrating examinations of religious and philosophical issues - all woven into a can't-put-it-down techno-thriller.